Article detailing the first two steps in exploring how to get my great great grandparents’ headstone cleaned and re-stood in a UK churchyard. If whilst doing the graveyard shift of your family history research, you find one of your ancestor’s headstones in a less-than-favourable condition, what can you do about it? This article might help you if you’re in the UK and thinking of having a gravestone cleaned up, repaired, or re-stood up. My Great Great Grandparents’ headstone toppled over at some point in 2011 or early 2012. It had always seemed sturdy, so this came as a surprise. I wonder whether it might have been helped on its way down? I’ll never know. 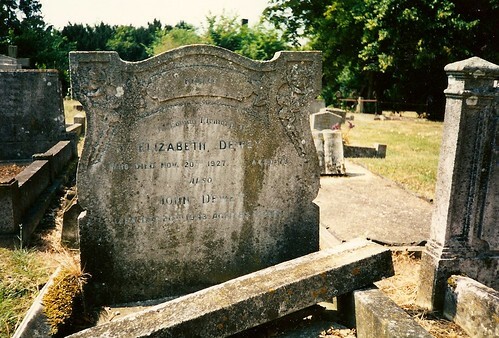 John and Elizabeth’s gravestone in 2012 – may have fallen over as long ago as 2011. When the headstone fell backwards, it landed partly on the kerb stones of the grave behind it, but fortunately it appears that neither grave sustained any damage. During the 00s, the church had a tidy up of their churchyard, and this included removing the kerb stones from the grave in order to help them mow the grass (don’t think they asked!). This would have probably have contributed to the gravestone’s instability, as it was never designed to stand on its own. Also, the grave stands in Cambridgeshire, and therefore with the heavy clay soil, it is prone to movement. The grave of John and Elizabeth, complete with some kerbstones, in about 1996. My first step was to email the church to find out how to go about having it re-stood and possibly cleaned. I received a friendly and helpful email back from the Canon to say that the church is not involved in that process but that I should contact a stonemason directly as they would then do the necessaries. Understandably the Cannon asked that, if I did go through with some work and the stone needed to be removed (perhaps for cleaning), that it would be best to keep her and/or the churchwarden in the know, so that its removal doesn’t suddenly trigger a search for a missing headstone. So, next step is the stonemason for an idea on costs and feasibility of cleaning it. 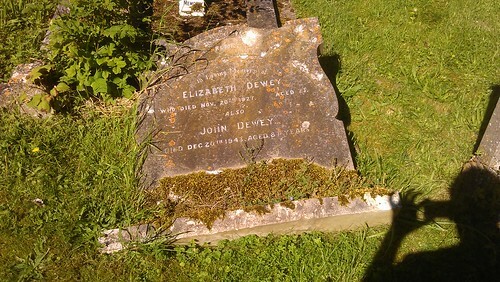 It’s worth bearing in mind that some lichen in the UK are protected by law, so I’m hoping that this will not be an issue here – and that I can bring this headstone back up to how it would have looked in 1943 after John Dewey’s burial. My reasoning for contacting the church first was down to a couple of conversations i’ve heard over the years about being charged by the church for setting a stone in place. No fee has been mentioned – perhaps an indication that the Cannon would be pleased to see a tidier graveyard. After Googling for stonemasons in the appropriate county, I emailed 3 of them to ask for rough ideas of prices for both the re-standing and cleaning parts, and included a link to the photo of the grave laying down. Insurance – what happens if the stone breaks whilst in their care? Marker – does a grave get a marker to a) mark the position of the grave and b) alert any visitors to the grave as to where/why the stone isn’t there? Admittedly I haven’t asked the last two questions yet, but as I don’t have a massive budget, I want to know that I have the first two options covered first.